Protecting families throughout Washington, D.C.
Anesthesia allows doctors to save patients whose lives would have been lost without surgery. It is one of the most valuable discoveries ever made in the field of medicine. But as with other medications, the wrong administration of anesthesia can have horrific results. Paulson & Nace, PLLC protects families whose loved ones suffered undue injury and harm at Washington, D.C. hospitals and health care facilities. We advocate on your behalf in courtrooms and during settlement negotiations after you or your family member has been injured because of an anesthesia mistake. When your family is suffering, our family wants to help. What constitutes an anesthesia mistake? Most people believe that an anesthesiologist will handle their injections. This is largely untrue. Certified Registered Nurse Anesthetists (CRNAs) rather than anesthesiologists are usually tasked with administering anesthesia. This is because there are more CRNAs available; in truth, most hospitals and healthcare facilities may only have one anesthesiologist on staff. Though CRNAs are trained nurses who have the skills to handle the procedure, they do not have the same training or education that anesthesiologists have. When the wrong dosage of anesthesia is administered, patients may suffer irreversible brain damage, slip into a coma, or have a seizure. Some patients may even be awake during the procedure if too little is given. Under the most tragic circumstances, an incorrect dose could lead to the wrongful death of the patient; an overdose can be fatal on its own, whereas an under-dose may cause the patient to go into shock or have a heart attack while on the operating table. At Paulson & Nace, we handle complex malpractice cases like these throughout Washington, D.C. Our skilled team of trial attorneys is unafraid of large insurance companies and hospital administrators, who put their profits and their budgets first on their priority list. We have secured millions of dollars for our patients, money that has gone towards medical expenses, lost wages, funeral expenses and pain and suffering. For all of its lifesaving capability, anesthesia is still a powerful and potentially deadly drug. 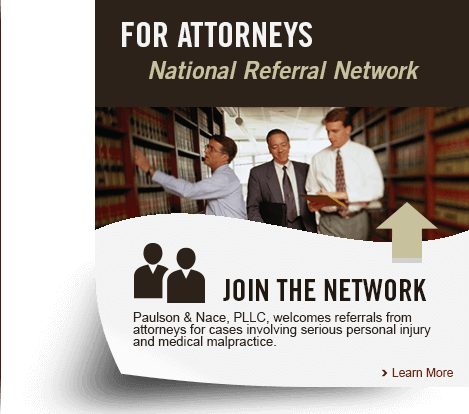 Paulson & Nace, PLLC, wants to hear your story if you suffered needless harm because of an anesthesia error. Please call 202.463.1999 or fill out our contact form to reserve a consultation time. We are proud to represent families throughout Washington, D.C.